Lizzy Welsh is a Melbourne-based musician whose main instruments are the violin and the baroque violin. 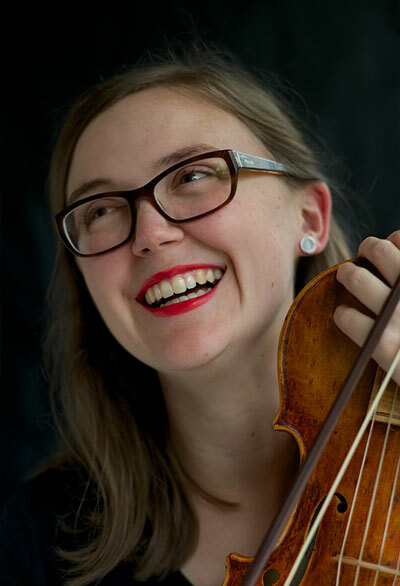 As a baroque violinist, Lizzy has performed with Orchestra of the Antipodes, Freitags-Akademien (Berlin, Germany), Accademia Arcadia, Gloriana Choir and the Australian Chamber Choir as well as in various experimental improvisation settings. As either soloist or chamber musician, Lizzy has appeared at the Bendigo International Festival of Exploratory Music, the Adelaide Festival, the Melbourne International Arts Festival, the Melbourne Jazz Festival, the University of California San Diego’s Springfest, Shanghai New Music Week, Wangaratta Jazz Festival, the Castlemaine State Festival and the Woodend Winter Arts Festival to name a few. As a new music violinist, Lizzy has performed with Golden Fur New Music Project, ELISION Ensemble, the Argonaut Ensemble and the Australian Art Orchestra and has presented many Australian and World premieres by composers including: Oren Ambarchi, Mark Applebaum, David Chisholm, Mary Finsterer, Alexander Garsden, Paul Grabowsky. George Lewis, Jobst Liebrecht, Liza Lim, Kate Neal, Anthony Pateras, Jon Rose, James Rushford and John Zorn.